This topic will contains full answers and solutions of the game Guess The Emoji developed by Random Logic Games LLC, the game is available for ios and android devices. You will have in this game to find words from emojis. Developper Says : Are you ready for a guessing game like none other?! 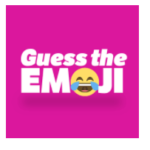 The ONE AND ONLY Guess The Emoji will entertain you for hours! Our endlessly fun emoji game tests your logic and reasoning skills to solve simple (and sometimes hard!) Emoji puzzles! You’ll be presented with a screen displaying emojis – what is it that these emoticons are describing?! Can you guess them all? The game is now finished, we hope that we have helped you to find missing words. you can comeback to gameanswer to check answers for other games !